In food processor or gallon-size resealable food-storage plastic bag, place granola bars and nuts; process or crush with meat mallet until chopped. In small bowl, mix yogurt mixture ingredients until well blended; set aside. In another small bowl, gently toss fruit mixture ingredients until coated; set aside. In each of 2 (12- to 14-oz) tulip-shaped parfait glasses,* alternately spoon about 3 tablespoons granola mixture, 1/4 cup yogurt mixture and 1/4 cup fruit mixture; repeat layers. Top each parfait with a sprinkle of remaining granola mixture. 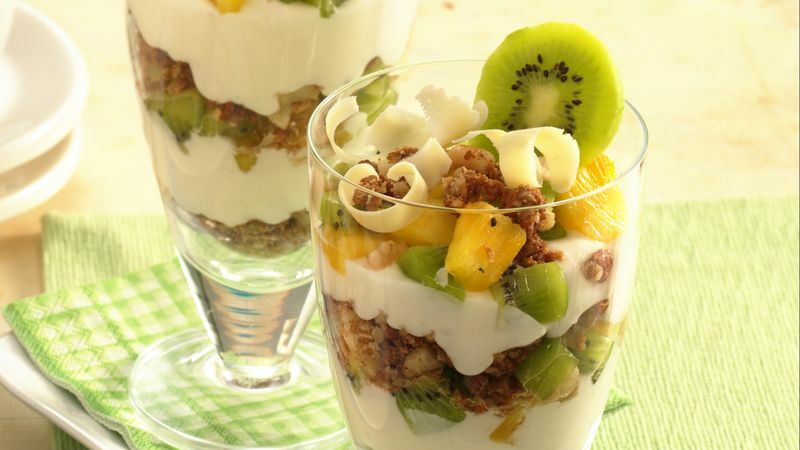 Garnish each with white chocolate curls and kiwifruit slice. Serve immediately. *Any 12- to 14-oz tall parfait, dessert or wine glasses can be used.